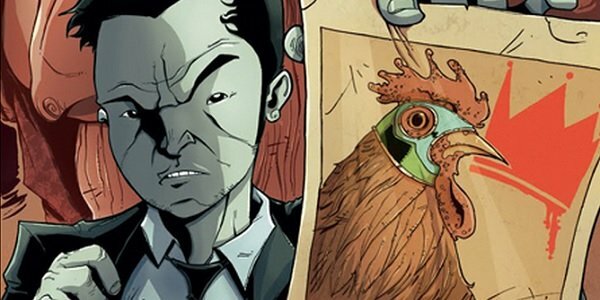 While the rest of the outside world just stands around completely unaware, fans of the exceptionally original Image Comics series Chew have been chomping on nothing but false hopes as one potential adaptation after another has slipped through the cracks. But production company Heavy Metal’s co-founders David Boxenbaum and Jeff Krelitz are now closer than anyone has ever been to bringing writer John Layman and artist Rob Guillory’s work to life, and they’ve hired The Walking Dead’s Steven Yeun and geek culture superstar Felicia Day to join the animated feature’s voice cast. Now all they need to do is hurry up and finish casting and animating before some other setback halts production. According to THR, director Krelitz (Torchwood: Web of Lies) thought Yeun was a "no-brainer" for the lead role of Tony Chu, an Asian American detective-turned-FDA agent with the rare distinction of being a cibopath, which gives him the power to psychically sense the history of an object just by tasting it. (With the exception of beets, of course.) This might be a more insignificant power if the story didn’t take place in a world where a bird flu killed millions of Americans, leading to a nation-wide ban on fowl meats, and an inevitable chicken-filled black market. Day will be voicing Amelia Mintz, Tony’s love interest who also happens to be a saboscrivner, which gives her the ability to describe food in such a specific manner that the person reading it actually feels as if they’re tasting it. As you can imagine, this leads to some particularly noteworthy gross-out moments, but she soon becomes a conduit for Tony’s enjoyment of food without using his taste buds. The next major bit of casting will have to be Tony’s biomechanical partner John Colby, or perhaps the antagonistic cibopath Mason Savoy, or possibly even Tony’s hate-filled boss Mike Applebee. Or maybe the cyborg rooster Poyo! But that might have to wait for a sequel. With The Walking Dead on a break from AMC until at least October, Yeun will soon be seen in the upcoming sci-fi drama I, Origins opposite Michael Pitt. Day, who had a recurring role on The CW’s Supernatural last year, was in Anton King’s recent romantic comedy Lust for Love and voices the character Ginger Root on Cartoon Network’s animated series Annoying Orange. The filmmakers plan on releasing Chew as a digital broadcast around the same time as a Blu-ray/DVD release. We’ll "chew" you in on an actual release date when it becomes available, so remember to "chews" Cinema Blend for all your movie "chews" ... er, news.